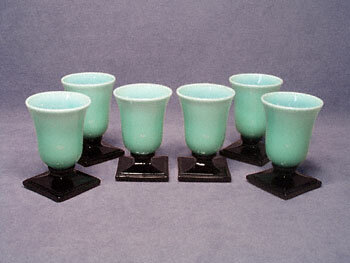 This fabulous set of six cocktail glasses is made of a glorious translucent mint green glass on a square stepped black glass base. The green glass is graduated from nearly opaque at the bottom, to almost transparent, and then again almost opaque at the top. Having clearly been crafted by hand with very subtle variations in the bases, each glass measures 3-3/4" tall on a 2-1/4" base, with a substantial weight of more than six ounces. 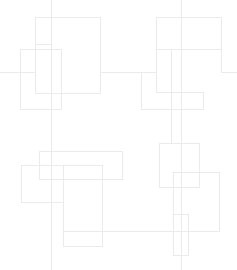 The rims of five of the glasses show a slight darkened rough area, presumably from manufacturing. Perfect as an elegant addition to the well appointed bar, this stunning set is in excellent condition, and a great example of vintage art deco barware.